When I was at the 2001 Pacific International Quilt show in Santa Clara, CA this past September, I stopped by the Elna booth and picked up a packet they were giving out in conjunction with Eleanor Burns (the Quilt in a Day lady). Inside the packet, among other items, were directions and supplies for making 2 different blocks. One block was a foundation-pieced crazy quilt, for which the foundation muslin was provided, which Eleanor (and assistants, I assume) would sew together and give to an Alzheimer's foundation. I did this and eventually sent the crazy quilt block in. The other block had a lovely 4 color, double-sided diagrams/illustrations printed instructions for contruction of a "Garden Gate" block *plus* a featured fabric (her new "Rainbow Floral" line) to be fussy-cut for the central square! I was able to fussy-cut 3 Garden Gate blocks but still had some of the feature fabric leftover. Rather than have 3 orphan blocks with nowhere to be used, I decided to just simply *use* the floral fabric and not be bothered that the 4th block wouldn't be fussy-cut. Since I was just really playing around, I did each block slightly differently from each other. I used similar yet different fabrics for the block elements, giving a slightly "coordinated" scrappy look. Well, after doing the 4th block, I realized that I couldn't do much of anything with them either ... so .. digging into my stash, I was able to find quite a few complimentary prints to make up 8 more "coordinated" scrappy blocks for a grand total of 12. Then I sashed and bordered them. I am trying to experiment with free-motion machine quilting on my home machine, in that I'm trying to get better at it. In a previous quilt, I had used a new-to-me product called "Stick-n-Stitch", which is essentially a firm, non-woven, pre-cut quilting motif that has some "sticky-note/temporary" adhesive on one side. You stick the motif onto your quilt top and stitch around the perimeter ... remove the motif and use it elsewhere. Depending on how linty your fabric is, the sticky lasts quite a while. Well, I had bought some blank sheets of the Stick-n-Stitch so I could make my own motifs, but I didn't have enough leftover for the size of motif I wanted for this quilt. In thinking about this product (which is *very* good, IMHO), it sure seemed to me that you use cut your motif from a non-fusible, non-woven interfacing, spray it with basting adhesive and you could have your own at a less expensive cost than buying their blank sheets. Unfortunately, I didn't have any of that kind of interfacing on hand. However, I did have dressmakers non-woven, non-paper pattern "tissue" .. it's *REALLY* thin stuff and although my idea of cutting out my own motif and using basting adhesive did work, I discovered that the dressmakers' stuff was too thin. By the time I was done with a couple of uses, it was tearing at stress points. I think if I had some real non-woven interfacing, this idea would have worked better. Next time, I'll try using contact paper, which others quilters have suggested. 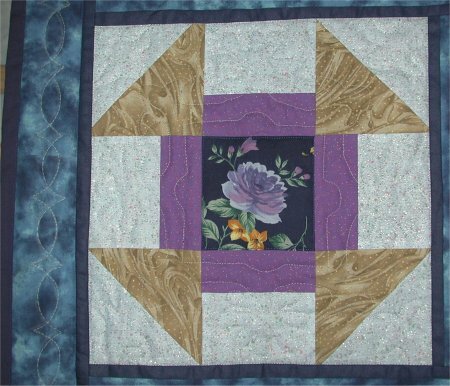 Here is a close-up of one of the original blocks, using Eleanor Burns' "Rainbow Floral" fabric, fussy-cut for the center square. You can also (hopefully) see some of the free-motion quilt I did in the block. For the border quilting, I used a quilting stencil and powdered chalk, which I stablized prior to quilting with hair spray. In the close-up picture, you might be able to still see the chalk, since I hadn't washed the quilt yet. 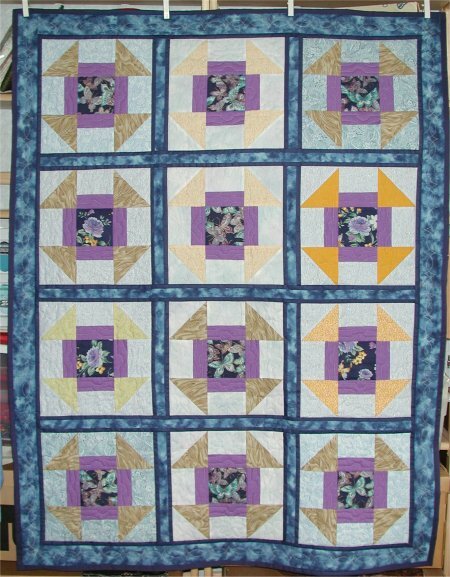 This quilt, Garden Gate, is one of the quilts that I send to help with the Taylor Bridge fire effort.